The Israel Defense Forces are part of the Israeli Security Forces. Template:Israelis The Israel Defense Forces (IDF) (Hebrew: צבא ההגנה לישראל Tsva Ha-Haganah Le-Yisrael ("[Army] Force [for] the Defense of Israel"), often abbreviated צה"ל Tsahal, alternative English spelling Tzahal, is the name of Israel's armed forces, comprising the Israel army, Israel air force and Israel navy. It was formed following the founding of Israel in 1948 to "defend the existence, territorial integrity and sovereignty of the state of Israel" and "to protect the inhabitants of Israel and to combat all forms of terrorism which threaten the daily life." The predecessors to the IDF were the Haganah (in particular, its operational branch, the Palmach) and former elements of the Jewish Brigade that fought under the British flag during World War II. See also Jewish legion. After the establishment of the IDF, the two Jewish underground organizations the Etzel and Lehi joined with the IDF in a loose confederation, but were allowed to operate independently in some sectors until the end of the 1948 Arab-Israeli war; after which these two organizations were eventually disbanded. See main article: History of the Israel Defense Forces for a detailed history of the IDF. The IDF falls under the command of a single general staff. The Chief of the General Staff (in Hebrew: רמטכ"ל, pronounced: Ramatkal) has the rank of (Lieutenant) General (in Hebrew: רב אלוף, pronounced: "Rav Aluf") and is the high commander of the IDF. He answers to the Defense minister and the Prime minister. The current chief of staff is (Lieutenant) General (Rav-Aluf) Dan Halutz, who replaced Moshe Ya'alon, on June 1st, 2005. National military service is compulsory for Jewish men and women over the age of 18, although exemptions may be made on religious, physical, or psychological grounds (see Profile 21). Israel is the only country which currently has female conscription. The fact that an increasing number of people in the Haredi community are exempt, has been a source of tension in Israeli society. Druze also serve in the IDF. In recent years, some Druze officers have reached positions in the IDF as high as Major General. Israeli Arabs, with few exceptions, are not required to serve, though they may volunteer. Six Israeli Arabs have received orders of distinction as a part of their military service; of them the most famous is a Bedouin officer, Lieutenant Colonel Abd El-Amin Hajer (also known as Amos Yarkoni), who received the Order of Distinction. Recently, a Bedouin officer was promoted to the rank of Colonel. Men serve three years in the IDF, as do the women in combat positions, while women in non-combat positions serve two. The IDF requires women who volunteer for combat positions to serve for three years because combat soldiers must undergo a lengthy period of training, and it is in the interests of the IDF to get as much use of that training as possible. In addition, men serve up to one month annually of reserve service, up to the age of 43-45. No direct social benefits are tied to completion of military service, but doing it is sometimes required for attaining security clearance and serving in some types of government positions (in most cases, security-related); Israeli Arabs claim, however, that this puts them at a disadvantage. Women were historically barred from battle in the IDF, serving in a variety of technical and administrative support roles, except during the 1948 war of independence, when manpower shortages saw many of them taking active part in battles on the ground. But after a landmark 1994 High Court appeal by Alice Miller, a Jewish immigrant from South Africa, the Air Force was instructed to open its pilots course to women (several served as transport pilots during the war of independence in 1948 and "Operation Kadesh" in 1956, but the Air force later closed its ranks to women fliers). Miller failed the entrance exams, but since her initiative, many additional combat roles were opened. As of 2005, Women are allowed to serve in 83% of all positions in the military, including Shipboard Navy Service (except submarines), and Artillery. Combat roles are voluntary for women. As of 2002, 33% of lower rank Officers are women, 21% of Captains and Majors, but only 3% of the most senior ranks. 450 Women currently serve in combat units of Israel's security forces, primarily in the Border Police. The first female fighter pilot successfully received her wings in 2001. In a controversial move, the IDF abolished its "Womens Corps" command in 2004, with a view that it has become an anachronism and a stumbling block towards integration of women in the army as regular soliders with no special status. However, after pressures from Feminist lobbies, The Chief of Staff was persuaded to keep an "advisor for Women's affairs". During 1950-66, Israel spent an average of 9% of its GDP on defense. Defense expenditures increased dramatically after both the 1967 and 1973 wars. In 1996, the military budget reached 10.6% of GDP and represented about 21.5% of the total 1996 budget. In 1983, the United States and Israel established a Joint Political Military Group, which convenes twice a year. Both the U.S. and Israel participate in joint military planning and combined exercises, and have collaborated on military research and weapons development. Israel has the official distinction of being a US Major Non-NATO Ally. As a result of this, America shares the vast majority of its security and military technology with Israel. The following is a very partial list that does not refer to any reserve forces. About 5 additional mixed unit battalions (Haruv, Shimshon, Nahshon, Lavi, Duhifat). consisting of a regular brigade and additional smaller units. Engineering company פלחה"ן in each infantry brigade. The Home Front Command, Pikud Ha'Oref was created to replace HAGAH after the 1991 Gulf War. It main role is to provide defence to civilians during wartime and mass-disasters. Distribution of NBC protection kits to civilians. Border Police (MAGAV) (a combat unit of the police, deployed mostly along the borders and in the West Bank and Gaza Strip; includes also a few special forces). Israeli internal security service. Work tightly with the IDF to counter Palestinian terrorism. See also: Israel Security Forces. Israeli modified F-16 flying over Masada. The IDF is considered to be one of the most high-tech armies in the world, possessing top-of-the-line weapons and computer systems. Besides purchasing American-made weapon systems (such as the M4A1 assault rifle, F-15 Eagle and F-16 Fighting Falcon jets and Apache helicopter), the IDF holds a large department of weapon development, Rafael (The Authority For Weapons Development), which develops new weapons and technology to the IDF. Most of the technologies are produced by the Israeli security industries including the IMI, Elbit, El-Op and the IAI. Israel's military technology is most famous for its guns, armored vehicles (tanks, tank-converted APCs, armoured bulldozers etc) and rocketry (missiles and rockets). An Israeli Merkava main battle tank. Currently Israel is the only country in the world with an anti-ballistic missile defense system "Hetz" and working with the USA on development of a tactical high energy laser system against medium range rockets (called Nautilus THEL). Also, Israel has the independent capability of launching satellites into orbit (a capability which is only held by Russia, the USA, Europe (UK, France independently as well), China, Japan, India, and Israel). Mk 3 LIC (modified for low intensity warfare, i.e. urban warfare). It is generally believed that Israel is a nuclear power. The weapons were thought to have been developed at the Dimona nuclear reactor since the 1960s. The first two nuclear bombs were probably operational before the Six-Day War and Prime Minister Eshkol ordered them armed in Israel's first nuclear alert during that war. It is also believed that, fearing defeat in the October 1973 Yom Kippur War, the Israelis assembled thirteen twenty-kiloton nuclear bombs. The current size and composition of Israel's nuclear stockpile is uncertain, and is the subject of various estimates and reports. FAS estimates that Israel probably has 100-200 nuclear warheads, which can be delivered by airplanes (A4 Skyhawk or converted F-4 Phantom II), or ballistic missiles (Lance, Jericho, or Jericho II missiles). The Jericho II is reported to have a range between 1,500 and 4,000 km, meaning that it can target sites as far away as central Russia. It has also been speculated that the Israeli Navy's three 1,925 ton Type 800 Dolphin class submarines may be capable of carrying nuclear-armed specially-modified Popeye Turbo cruise missiles. These missiles are purported to have a 1,500 km range and are supposedly fired out of what are suspected to be unusually-sized additional torpedo tubes that were allegedly installed on the Dolphin submarine and are otherwise larger than what is required to accommodate any currently known western torpedo design in existence. A test of such a missile is alleged to have taken place off the coast of Sri Lanka in May 2000. Nevertheless, some military analysts have labeled such rumors to be highly unlikely and impossible given the logistics of the submarines. Furthermore, there is no factual basis for the origins of the alleged test firing. The Israeli government has neither acknowledged nor denied that it possesses nuclear weapons, an official policy referred to as "ambiguity". 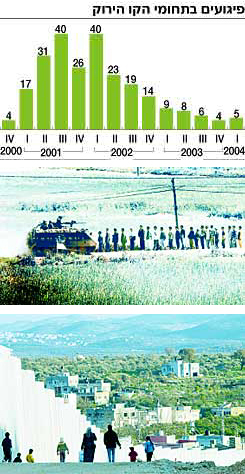 However, a formerly imprisoned ex-Dimona employee, Mordechai Vanunu, confirmed much of the earlier speculation. If the ranks of the IDF are to be translated one-to-one to Western ranks then a "Rav Aluf" is equivalent to Lieutenant General (since Major General is "Aluf"). But since Rav Aluf in Israel is the high commander of the army (including air force and navy), the translation of it as "General" is more appropriate. In the IDF, the same ranks are used throughout the army, including air force and navy. This contrasts with many other armed forced that have a separate rank system for different branches. In 1992, the IDF has written down a Code of Conduct that is a combination of international law, Israeli law, Jewish heritage and the IDF's own traditional ethical code - Ruach Tzahal רוח צה"ל ("The Spirit of the IDF (http://www1.idf.il/DOVER/site/mainpage.asp?sl=EN&id=32)"). Purity of Arms טוהר הנשק - "The IDF servicemen and women will use their weapons and force only for the purpose of their mission, only to the necessary extent and will maintain their humanity even during combat. IDF soldiers will not use their weapons and force to harm human beings who are not combatants or prisoners of war, and will do all in their power to avoid causing harm to their lives, bodies, dignity and property". Critics, including B'Tselem and Amnesty International accuse Israel of frequently violating their own purity of arms and code of ethics, and protecting soldiers who do. (See also, Deir Yassin massacre, Qibya massacre, Kafr Qasim massacre. Many anti-occupation activist groups and individuals often refer to the IDF as the "Israeli Occupation Force" (IOF). This alternative title expresses their belief that the primary role of the IDF is maintaining the "Occupation" of the Palestinian territories, rather than "Defense" of Israeli citizens. Some even refuse to use the official title at all, claiming it is a propaganda term. Owing to the ongoing Israeli-Palestinian conflict, the tactics of the IDF have been adapted for low intensity warfare primarily against Palestinian militants operating from within densely-populated civilian areas. Sometimes, such clashes have resulted in deaths of nearby civilians. IDF Caterpillar D9 Armored Bulldozer. The D9s have been operated pervasively through the al-Aqsa intifada, keeping Israeli casualties low but causing extensive damage to Palestinan property, and often causing indirect or direct harm to Palestinians themselves. The IDF also employs a controversial strategy of assassinations (called "targeted killings") of Palestinian militant leaders. Those policies are largely supported by Israeli society, but there are exceptions: In 2003, 27 IAF Air Force pilots composed a letter of protest to the Air Force commander, announcing their refusal to continue and perform attacks on targets within Palestinian population centers, and claiming that the occupation of the Palestinians "morally corrupts the fabric of Israeli society". This letter, the first of its kind emanating from the Air Force, evoked a storm of political protest in Israel, with most circles condemning it as dereliction of duty. IDF ethics forbid soldiers from making public political affiliations, and subsequently the IDF chief of staff announced that all the signatories would be suspended from flight duty, after which some of the pilots recanted and removed their signature. See also: urban warfare, counter terror, CQB. As of 10 June 2005, the above list is no longer up to date, though all the positions remain officially in effect for the next several months. List of brigades in the Israeli Defense Forces. Haaretz report: "From 40 attacks per quarter to 5 attacks per quarter" :English (http://www.haaretz.com/hasen/spages/413396.html) - Hebrew (http://www.haaretz.co.il/hasite/pages/ShArtPE.jhtml?itemNo=413586&contrassID=2&subContrassID=1&sbSubContrassID=0) - Graph 1: Thwarted attacks (yellow) vs successful attacks (red) (http://www.haaretz.co.il/hasite/images/printed/P080404/zza.jpg) - Graph 2: Suicide bombing within the "green line" per quarter (http://www.haaretz.co.il/hasite/images/printed/P080404/a.0.0804.10.2.9.jpg) . This page was last modified 12:47, 23 Jun 2005. This page has been accessed 54530 times.